As a New England native, I’m predisposed to fall. The air gets crisp, the trees burst with color, and pumpkin coffee draws excited crowds out to all the local coffee shops. I’ve come to learn, however, that inasmuch as I love this season, many people are not so attached. For years I wondered how this could be; but when I entered the field of Traditional Chinese Medicine, the reason became clear. In most places across the Land of the Free, fall merely marks the downward spiral into winter--a season of short days, chilly nights, and colorless, dreary skies. As physicists have explained time and time again, everything is energy. Energy makes up our bodies, the world around us, the food we eat, the air we breathe--everything about life and matter. The seasons, therefore, have their own energies as well. Traditional Chinese Medicine (TCM), which is very rooted in the principle of energy, sees summer as the most Yang (vibrant, hot, excited, active) time of the year, while winter is seen as the most Yin (cool, calm, dark, heavy). Fall is a hinge, a transition period out of the Yang and into the Yin. We see this in the physical changes marked by the season: the leaves changing color and falling off the trees, the animals collecting and storing food for the winter, how we start wearing extra layers and perhaps going to bed a little earlier. We, and nature are preparing for the cold, the winter, the most Yin time of the year. This transition can be seen and felt as a preparation for loss, a time of letting go of the warmth and sunshine and turning more towards a time of stillness, waiting, and introspection. TCM connects each of the seasons to specific meridian/channel systems in the body. Autumn correlates with the Lungs and the Large Intestine meridians. Today we’ll focus primarily on the Lung meridian system because it is incredibly vulnerable this time of year. 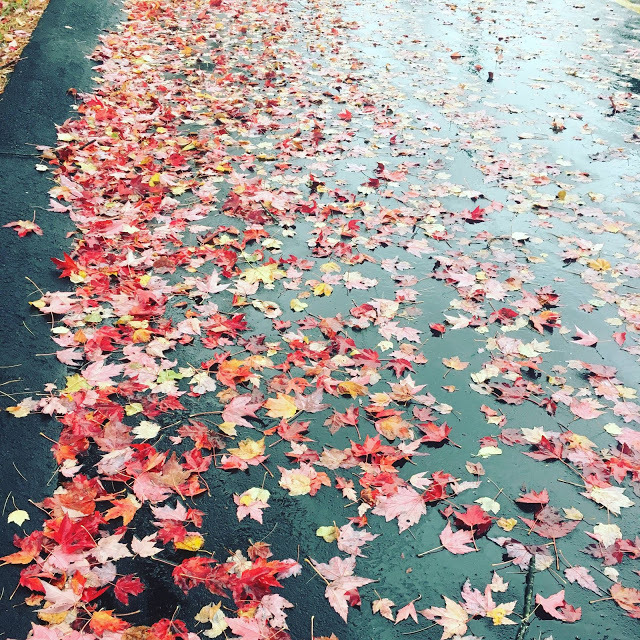 In TCM, the Lungs are known as the “delicate organ.” They are substantially affected by cold and dry temperatures, wind, fluctuating seasonal changes, and sadness/grief--all things that transpire in the fall. When the hours of daylight shorten, the leaves and other plants begin to die, and the temperatures get cooler, is it a very common thing for people’s moods to also drop--many people even have this diagnosed as seasonal affective disorder (SAD). Basically, fall creates the perfect storm against the Lungs, and they become very easily damaged. This in turn causes more sadness, colds and flus, seasonal allergies, shortness of breath, difficulty exercising or walking upstairs, abnormal sweating, and even a chronically hunched over posture that the body adapts in order to protect the lungs--often leading to upper back and neck tightness. If these ailments continue long enough and cause enough imbalance in the body, then urinary issues, asthma, and long-standing depression can develop, which can then offset other symptoms and imbalances connected with other meridian systems. So what’s the takeaway? Take extra good care of your Lungs this time of year! Following are 3 of the simplest ways you can ensure you make it through this transition period with an uplifted spirit and a healthy set of lungs. One of the easiest and most effective ways to take care of your Lungs is to breathe deeply. Sounds simple, right? Well, when anxiety and stress set in, one of the quickest things to go is our attention to the breath. We begin to hold our breath or take really shallow gulps of air--oftentimes through our mouths, which can contribute to the anxious feelings. To ensure deep and steady breath, begin by taking really conscious breaths throughout the day, inhale through your nose, and exhale through your nose. Fill up your lungs all the way to the top and then exhale every ounce of air out. If you find yourself in a stressful situation, start counting your breath and make your exhales slightly longer than your inhales--this doesn’t have to be substantial to make a difference, even a slight elongation of the exhale can help. Lengthening out your exhales will calm your sympathetic nervous system and instantly have a calming effect on the mind and the body. Do some yoga poses to help open up the Lung meridian. The Lung meridian runs along the inside of your chest, across your pectoral muscles. This is one of the first areas to tighten when the lungs are affected, and as mentioned above, this can set off a domino affect and create a tremendous amount of pain and tension in your upper back and neck. You can work to gradually open this area every day to ensure this doesn’t happen by doing these 3 simple poses. Go deeper into each one until you begin to feel an opening or a stretch but you do not lose control and depth of your breath. Your breathing should not suffer as you go deeper into the pose. Keep your inhales and exhales long and steady. 2. Broken/Open Wing Pose is referred to by many different names. Whatever you choose to call it, this is a must-do for your Lung meridian this fall; it is second to none when it comes to opening up your pectoralis muscles. This pose can be done with a bent or straight arm. I prefer bent and find it gets more into my pectoralis minor this way which is a huge player in poor posture. There are many different stages to this pose--get into them slowly and check in with your body and your breath every step of the way. Options to ensure neck safety and stability are to place a block under your head or to do this pose at a wall. Begin by lying face down with your arms out to the side, then simply start to open up in one direction--your top leg can bend and the sole of your foot can plant on the floor if you have the flexibility and openness in your chest. 3. Heart opener with blocks is my absolute favorite! It’s an amazing heart opener and it puts my mind instantly at ease. 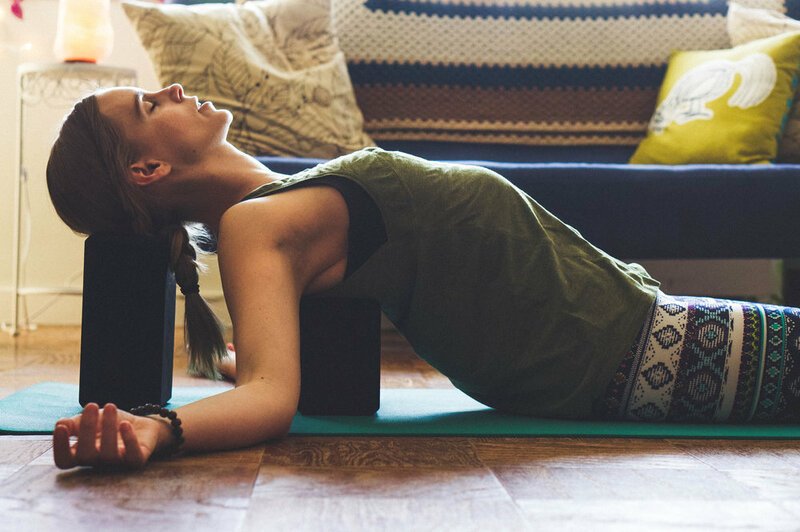 This is done with two yoga blocks with the block under your head being a higher height. The second block goes right between your shoulder blades level with the bottom of your scapula (the triangular shaped bones on each side of your back). If you don’t own yoga blocks, this pose can be done by stacking different books to your desired height--just ensure that your head is slightly higher than your back, this helps protect your neck. Then open your arms out the the side, palms face the ceiling and allow yourself to settle into in the pose and soak up the benefits with some deep belly breaths. Yes, the Lungs are vulnerable to the cooler temperatures, but there is nothing better for them than breathing deep in the great outdoors. Take short walks and make an effort to spend time in nature daily--just ensure that you are dressing “seasonably." A great thing to start adding to your fall attire is a scarf around the neck. Who knows? Maybe you could even get a little wild and connect all 3 suggestions--take a walk outside with your yoga mat, and set up to do some deep breathing and some lung opening yoga poses all at the same time! If we can begin to understand the energetics of each season and what imbalances and symptoms they tend to cause in the body, then we can take better care of ourselves and prevent future illnesses and dysfunctions. Staying on top of your health preventatively is the best form of medicine.